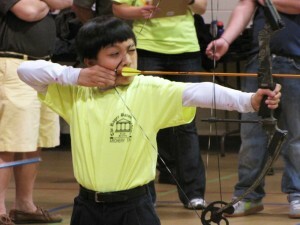 The Roger Bacon Academy archery team member and North Carolina State Champion George Austria – grade 5 competes in the 2011 NASP® state tournament. Sometimes when you shoot for the moon you end up competing for the world. And another world title is exactly what The Roger Bacon Academy (RBA) Archery team is shooting for again. Advancing from state champions to national contenders, the archery team is headed again to Orlando, FL to compete in the National Archery in the Schools Program® (NASP®) World Tournament in the fall. The archery competition journey started on February 21, 2011 when two archery teams -the RBA Elementary team and the RBA Middle School team – competed for the NASP® North Carolina State Championship. The Elementary team won first and became the N.C. State Champions while the Middle School team took third overall. Individual state champions, based on individual scores, were awarded to George Austria -grade 5, Caeleigh McGuire – grade 5, Will Britt – grade 8, and Hunter Johnson – grade 8. Johnson earned the title of “World Champion” in last year’s NASP® World Tournament. Both teams moved on to compete in the 2011 NASP® Nationals in Louisville KY last weekend. The National tournament, which is growing tremendously every year, saw nearly three hundred teams and over 8,000 students compete in the three-day event. The Roger Bacon Academy was one of three teams from North Carolina to compete in the tournament. Both RBA teams and individual students did well enough in the national tournament to be invited to the NASP® World Tournament held October 6-8th in Orlando, FL. Based on scores from both teams, a combined RBA Archery team will be sent in the fall. The RBA Archery team was sponsored for this trip by the Bladen Lakes chapter of the Quality Deer Management Association (QDMA), Windham Distributing, The Roger Bacon Academy, and Coastal Habitat Conservancy LLC. The National Archery in the Schools Program® brings the sport of archery to millions of students in schools across the United States. Designed to teach International style target archery in physical education class 4th-12th grades, core content covers archery history, safety, technique, equipment, mental concentration, core strengthening physical fitness and self-improvement. Students shoot at 80 cm bulls-eye targets placed before an arrow curtain in their gymnasium or an outdoor range. Equipment used is state-of-the art and designed to fit every student.